Ironically, a branch line railway from Chepstow to Monmouth which was planned in mid-century to cope with industrial expansion was left without its original purpose. An Act of Parliament authorising the line was approved in 1866, and the line was built at cost of £222,000, linked by spur to Tintern wire works via a bridge still in use as footbridge across the Wye. But by the time the railway was opened in 1876 its industrial purpose had all but vanished, and after a period steady decline the brass works closed finally in 1901. Nevertheless, during this period of decline a new ‘industry’ was emerging in Tintern, namely tourism, which made use of that other great resource of the Wye Valley, namely its outstanding natural beauty, combined with its rich religious and secular history. The arrival of the railway in 1876 helped to boost the popularity of Tintern, and in the early 1900s, crowds of up to 1300 would travel on a special train journey to see Tintern Abbey on the night of the harvest moon. This saved the railway – for a while but, after being amalgamated with the Great Western Railway in 1905 and nationalised into British Rail following the Second World War, it was closed to passenger traffic in 1959 amidst widespread protests and publicity in the national media. 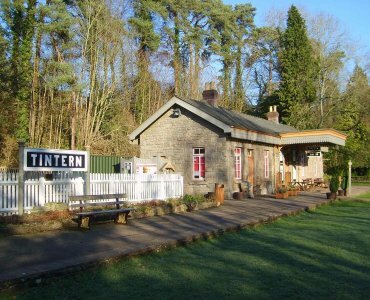 The station at Tintern, once a substantial site with goods yard, engine shed and station master’s house, was opened to the public again in 1975 and is now a popular tourist and heritage centre.